If it were anyone else in the world, they’d be crucified. But Jon Jones had another drug test come back positive for trace amounts of steroids, and since it’s Jon Jones, it’s apparently okay. I think it’s fair to label this sort of thing as “Jones privilege”, no? Steroid metabolites have been found in Jon Jones’ system again. Jones, the UFC light heavyweight champion, was drug tested in competition by the Voluntary Anti-Doping Agency (VADA) in relation to his UFC 232 fight last month with Alexander Gustafsson. The results, which came back this week, showed that the long-term oral Turinabol metabolite that has plagued Jones for more than a year was present, according to information obtained by MMA Fighting from the California State Athletic Commission (CSAC). CSAC will not take disciplinary action against Jones, executive officer Andy Foster said. This is the same, long-term M3 metabolite that Jones was suspended 15 months for stemming from a July 2017 sample collection in relation to UFC 214, Foster said. Foster said subsequent drug tests on Jones done by VADA, UFC partner USADA, and the commission have come back clean since the in-competition abnormal reading, including fight-night tests. If you’ll recall, the UFC had to move an entire event during fight week because they wouldn’t have been able to get Nevada to recognize the ol’ Jones privilege in time. Instead, UFC 232 was moved to California, where Jones fought and beat Alexander Gustafsson in a rematch. The post Jon Jones Still Has Drugs In His System, But He’s Jon Jones So It’s Okay appeared first on Caged Insider. I really have nothing to add to the following, except that I’m angry at this whole sport and another entire sports-entertainment industry I don’t even cover for making me watch it. The backstory here is that Henry Cejudo went on Ariel Helwani’s show and admitted he had a huge crush on Nikki Bella. For some reason she responded to Henry Cejudo… favorably… Always shoot your shot, I guess. You never know. That has to be the lesson here, right? Other than maybe don’t flirt online like this where other people might see it. Please. Please. I can’t decide which is worse, her video or his response. He’s even worse at ripping off the Rock than he is at… whatever this was. I also can’t tell if Bella is serious, or just doing this for clicks. Otherwise, why make a public video? Why subject us to this? This kind of flirting might work in the DMs… but not when all of us can see it, unless of course, that’s the point. This is Cejudo and Nikki Bella; this is what they are putting us through, and the rest of us are the guy at the end. Sometimes an athlete in combat sports pulls off something so spectacular that you have to watch it a few times to really take it in. Fortunately, that’s exactly what the Graphics Interchange Format (GIF) was invented for. This guy held two fully grown men like it was nothing. I’m the last person to have pro wrestling opinions, but since I’m on a Sumo kick, why don’t we see more Sumo or ex-Sumo guys in pro wrestling? Good point by Micheal Chiesa. “Donkey” was used by the creator, Miyamoto, to convey stubbornness; it was laughed at but the name stuck. This isn’t conclusive by any means, but it could be concerning for combat athletes. Leslie Smith’s got a point, and that didn’t happen overnight. It took decades of fighting for the players to get to this point. I doubt MMA will ever get there. I want to see more of this raised platform so we can get Sumo-MMA hybridization. I love to look at pictures of snow a lot more than I liked living in the cold. Yair Rodriquez earned a win over Chan Sung Jung last Saturday night at UFC Denver, knocking the Korean senseless with a no-look upward elbow strike. The dazzling technique led some critics to claim the Mexican was “lucky” to land the killer blow. 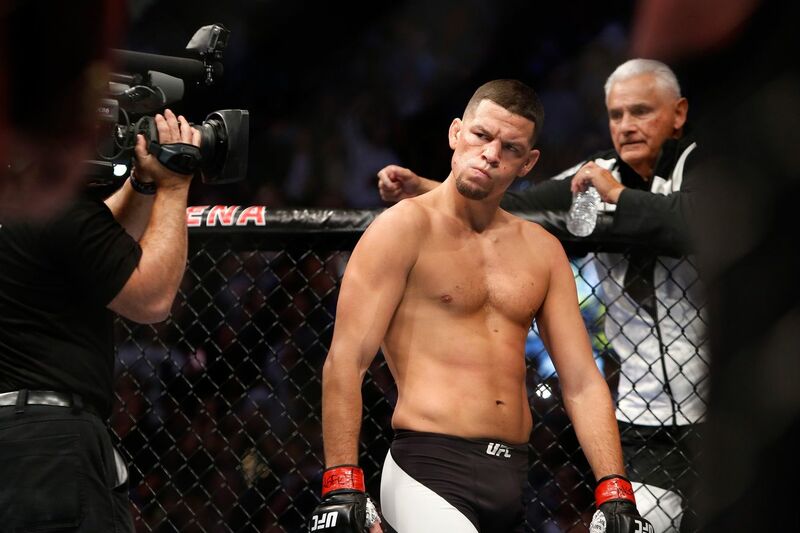 Despite UFC 230 not having an official main event, Ultimate Fighting Championship (UFC) president Dana White is refusing to entertain a 165-pound title fight between co-headliners Nate Diaz and Dustin Poirier. Both lightweight fighters have lobbied on social media over the past few weeks to turn their three-round scrap into a five-round championship bout in effort to take the main event spot on Nov. 3 live on pay-per-view (PPV) from inside Madison Square Garden in New York City. Scheduling such a fight would force the promotion to create an entirely new division just to save a single PPV card. While UFC has pulled off some trickiness in the past to bolster an event, White is not open to it this time around. Adding gasoline to the fire was a recent tweet by Diaz suggesting the bout was off because Poirier didn’t want to fight at 165 pounds (shown below). This comes after Diaz hinted at not fighting at UFC 230 following a press conference back in August. Even though UFC 230 has no main event in place with just over one month to go, White is not looking at Diaz vs. Poirier to fill that void. In fact, the UFC president suggests it was never even an option. “Not only will there not, we did not ever discuss that with him, was never an option, or anything,” said White. For now, Diaz vs. Poirier is locked in as UFC 230’s co-main event. If Diaz actually shows up for his first Octagon appearance since a decision loss to Conor McGregor two years ago, his clash with “Diamond” could be one of the best of the year. Donald Cerrone has parted ways with longtime gym Jackson-Wink MMA ahead of his UFC Fight Night 139 showdown with Mike Perry, and to hear him tell it, it wasn’t on the best of terms. 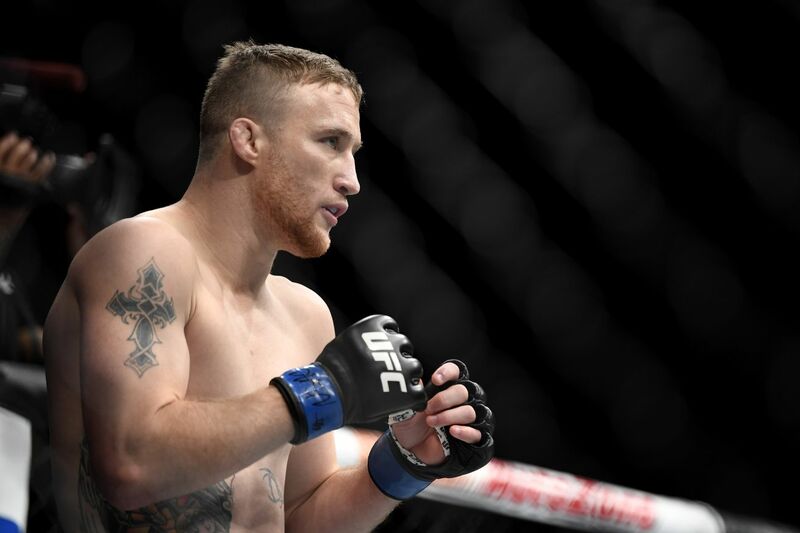 Coming off a two fight losing skid, Gaethje wants to show the world – and himself – he’s still championship material. Justin Gaethje is in a strange place with his career. On one hand, he’s at the height of his fame, with many UFC fans considering him one of the most entertaining fighters in the sport. On the other, his UFC record currently sits at 1-2 with two bad knockout losses in his last two fights. He’s now facing James Vick at UFC Lincoln on August 25th in what many consider a softball match up — relative to facing Eddie Alvarez and Dustin Poirier back to back, anyway. Gaethje previously said that he’d retire if he got outclassed by Vick. Now in a new interview with MMANYTT he’s clarifying that statement somewhat, saying he’ll retire if he feels he’s no longer UFC champion material. As far as Gaethje is concerned, those two losses were valuable experience that will make him a better fighter down the road. And if James Vick wants to dismiss him because of his recent losses, he does so at his own peril. Gaethje has talked a lot about the changes he’s making leading into this fight, and it certainly seems like Saturday in Nebraska could be a make or break moment for his career. Will we see a new and improved Gaethje 2.0? Or will he throw caution to the wind as usual once the leather starts flying? I’m not even sure which way I want it to go. Last week the Ultimate Fighting Championship held a press event to promote the remaining fights of the year and threw a curve ball when it announced an explosive lightweight bout between Dustin Poirier and Nate Diaz at UFC 230 in New York.